My Blue Merle Seems To Have Changed To A Red Merle? 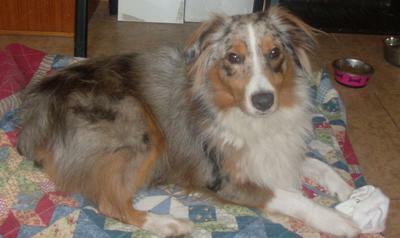 I have a male Australian Shepherd who was a blue merle baby. He is now two years old and looks more like a red merle now. I read that if their nose is black that they are indeed a blue merle and not red. I've also read that many times their coats will change color as they mature. There are dogs called "Harlequins" and I was wondering if he is that. Here is a baby picture and how he looks now. Any help would be appreciated. I don't really care if he is blue or red, but I would like to educate myself so that when I'm asked I know what the true answer is. I was told by someone that he has a very dark brown nose, but I'm sorry, to me it is definitely black. Thanks for your help. Comments for My Blue Merle Seems To Have Changed To A Red Merle? 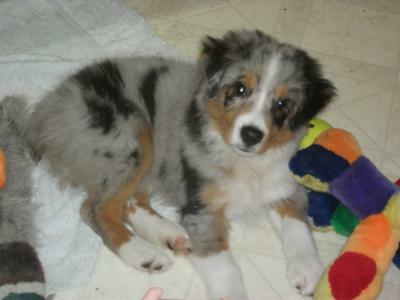 Looks like your Australian Shepherd is a blue merle with white and tan. The "red" you see is actually tan. 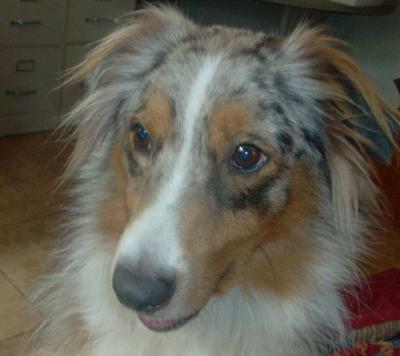 You can find more info about Australian Shepherd Colors and Markings here. yes, he is a blue merle with copper points. The "tan" has red in it, so it is referred to as "copper." Most blue merles have copper points to varying degrees, some a little, some have much more, as yours does. A red Merle would be light red with darker patches of red in the light red. I think what you are seeing is that as he grew his copper came in a littler heavier than when he was a pup. But he is all beautiful fellow whatever he is. Think this is one of the things I love most about this breed, so many different color schemes! Definitely blue Merle. Red Merle has no black or gray, Google red Merle and you'll see the difference. Both very beautiful. Thank you everyone for all your helpful comments. This has helped me to understand more about Aussie coloring and to know that my breeder was correct in telling me that he is a blue merle. I would love him whatever color he is. I just wanted to be correct when people ask me what color he is and not feel like I don't know what color my dog is. Thanks!! He looks just like our Blue Merle girl and she is a show-stopper. Blue Merle to a red? She is still a blue merle with beautiful copper highlights. She looks very much like my Graysie Mae. This site is so awesome. Thanks to all you nice and knowledgeable Aussie owners. You have been so helpful. He's a "Blue Merle Tri" as in Tri colored. A straight Blue Merle will not have the Copper Points. With both of my BMT Aussies their Copper Points came in bolder as they aged. Very normal, nothing to worry about. I have a tri color who is supposed to be my service dog some day but she is so lonely for canine company. My breeder tells me I can't raise another Aussie with a service trainee. You have a blue merle with copper points. I have a blue merle with copper points and a black-tri with copper points. Together, they're quite a sight. I get a lot of compliments about my girls. You Aussie is gorgeous! I have a blue Merle toy Aussie. Black nose, one blue eye & one brown eye. He was supposed to mature to 13lbs and is 28 lbs at one year old. I am not happy about his size and weight because I paid for a very small dog. But I love him and he’s mine for life! His color changed drastically. He had much more white and light grey with tiny spots of black. He has more dark grey and black, a little red and little white now. I keep his hair cut very short which draws out his gorgeous blue coat. I love I. So. California where it’s 110 degrees so he loves his short cut. I tried to post a photo but couldn’t. I will try again. I have a blue merle I thought...as well his spots are turning to a red color not copper color? I of course love him the same but I have to admit it's not that pretty...black red/brown and gray with blue of course. I have a Blue Merle going on 10 months. By your pictures i would guess you have a red merle. Have you consulted your breeder and whats on your papers. However your dog is beautiful. They do change during first year from what I have read.